As a member of our club you know the luxury boating lifestyle. If you’re passionate about boats and our boat club, why not take a Sunday morning off and come down to the club for a couple of hours. 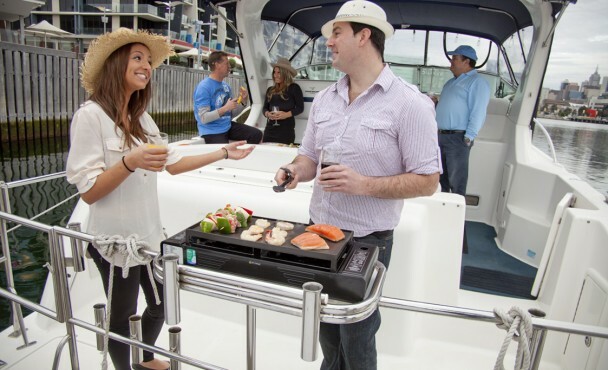 You’ll enjoy a sumptuous cooked breakfast, a glass or two of champagne on one of our luxury cruisers, talk boats and share boating stories while you cruise around the Yarra. And helping us help new people with Docklands boat hire also means you’ll earn extra standby points while you meet and enjoy like minded people, other members of our club, potential new members and come for a short cruise on the boat. Yes, when you help your club, we want to help you in return. We’ll add 100 points to your standby total and that gets you more time on the water doing what you love. We invite you and potential new members interested in Docklands boat hire and the club to come and experience our boats on Sunday mornings. We like to have a handful of current members with us who enjoy sharing their enthusiasm while we serve you breakfast. Breakfast starts at 7.30 and you’ll be away by mid morning – unless you want to stay and play boats – rather than lawns, the choice is yours. Email us at gem@pleasurecruising.com.au now so we can enjoy your company and organise our catering.